Last week was incredible! I’d like to share a few snapshots to give you a feel of the campaign so far. Yesterday I represented the New Democrats at a Agriculture debate on the mainland in the morning and marched in the Earth Day rally on the island in the early afternoon and then door-knocked until dusk. 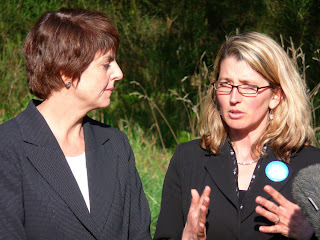 A few days ago the Conservation Voters of BC announced their endorsements for the election. 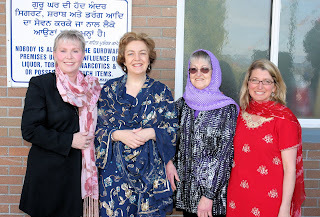 They only supported four candidates in the whole province – and I was one of them! They wrote: “Our endorsements are designed to put stronger environmental voices in the BC legislature. Our endorsees are individuals who have shown strong leadership on climate change and other local issues. They will be an asset to the Legislature." Last week was also very special because NDP Leader Carole James dropped by my farm to meet local farmers and hear, first hand, the issues that are important to them. Carole and I spoke about the importance of local agriculture and it turned into quite a gathering with local and provincial media and many, many supporters. Here is a video. It was also an amazing week in terms of fund-raising, our best week ever. It is really very humbling to see so many people contributing what they can to this campaign – it definitely redoubles my commitment to work every day to protect our quality life and to secure our children’s future. We have a lot of money still to raise – please help! Click here to make a donation to the campaign. April 28 - CFAX 1070, on-air debate between Lana, Dallas Henault (Liberal) and Adam Saab (Green) on the environment. 9 - 9:30 am. Please call-in and ask questions. 250 386 1161. 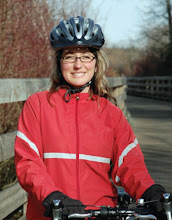 April 29 - All candidates, Saanich South, 7:30 pm, Unitarian Church, 5575 West Saanich Road. Sponsored by Prospect Lake Community Assn. 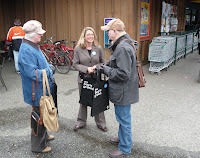 April 30 - Food Matters, Regional (I’m representing the NDP), 7-9 pm, First Metropolitan Church Hall, 932 Balmoral (@ Quadra). ees in this province that are over one thousand years old. They and their immediate ecosystems must be protected. Columbians take in the tradition and culture of B.C. 's Sikh, Indo-Canadian and South Asian communities. Vaisakhi allows all of us to come together and celebrate the South Asian community's culture as part of our province's collective heritage. It helps us learn about one another and strengthen our pride in our shared customs. And this week will be even busier!!! P.S., By the way, I am now twittering, please click here if you want connect.